Did you remember to join and opt-in for communications from Applause when you registered your student through InfoSnap? If not, there is still time to join – we encourage you to visit our website and follow us on Facebook. It’s the best way to find out about upcoming music events throughout the year. There are many exciting things coming up this year. Here are some key dates to get a jump-start this fall. Mark your calendars for ‘Uniform Pick-Up Day’ during enrollment August 15-16, 2018 from 9am to 3pm. BAND and CHOIR students, after you pick up your books – head down to the music rooms to get fitted for your uniform. Please bring a check (or cash) to pay your band fee. Freshman and new band/choir students will have expenses for cummerbunds, bow ties, etc. Orchestra will receive their uniforms after school starts. If you would like to help with uniforms on either of these days, please contact Susan Updike at supdike77@gmail.com or Jill Ginocchio at ginocchio1@sbcglobal.net. The band begins its rehearsals on Tuesday, August 14 from 5pm – 7pm and goes through the week. Stay tuned to your email and Facebook for more times/information. 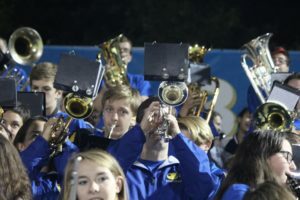 The band performs at four home football games this fall so mark your calendars! We can't do it without you! Applause promotes student recognition, awards and scholarships; publishes the musical arts e-newsletter; sponsors the Honors Competition; coordinates the Spaghetti Dinner; assists with the Citrus Sale; manages all uniforms; and provides concert ushers, receptions, decorations and publicity. Funds raised have gone towards the purchase of equipment, grants for visiting artists and master classes, scholarships and the spring trip abroad. We have all sorts of opportunities to help with Applause from small to large roles…you can bake treats for concerts, help with the citrus sale or spaghetti dinner, serve on the board or many other opportunities. Please email Allison Waggoner at allisonwaggoner@aol.com for more information. Thank you!